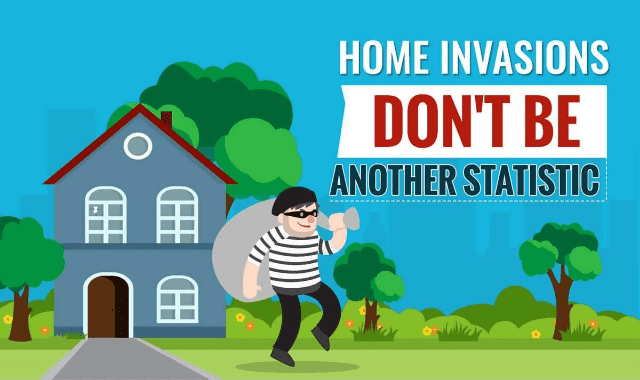 Home Invasions Don’t Be Another Statistic #Infographic ~ Visualistan '+g+"
In an ideal world, no one would have to worry about becoming the victim of a crime. However, as we all know, that is not the world that we live in. Hopefully, most of us will go through life unscathed and safe from being added to lists of statistics; unfortunately, some of us won’t be so lucky. Not many thoughts are more terrifying than the idea of someone invading your home. On average, 3.7 million homes experience a burglary each year in the United States, and almost a third of these incidents occurred while at least one person was home. By arming yourself with knowledge about what draws a burglar to your property, you can ensure preventative measures are taken to reduce the likelihood of being targeted. Below, we’ve compiled tips for ensuring you can keep your home safe along with some relatively inexpensive tools that can be incorporated into your self-defense plan so that you can maximize your ability to protect yourself and your loved ones.